Designed and created by nineteen very talented and dedicated women is our stunning 40th Annual Fair Quilt. The idea of making such a quilt was sparked at our 39th Annual Fair. A planning committee consisting of Elmira Seibert (chairperson), Virginia Fry, Pauline Hood, Dessie Moxley, Mary Streaker, and Kim Sullivan, oversaw the making of the 116 in. X 86 in. quilt from its beginning in November of 1984 though its completion just hours before the opening of our 40th Annual Fair in August of 1985. Thirteen different blocks, each pieced and/or appliqued with embroidered details, depict various aspects of the fair capturing ideas that were inherent to the fair in 1946, as well as 1985. The outside border is quilted with boys and girls hand in hand with prize ribbons to represent the people who “make the fair go ‘round.” On the reverse side, each quilted square is identified with a counted cross stitched square listing the names of the artist, appliquer, embroiderer, quilter, and labeler. This cooperative quilt truly captures the spirit of our fair. Our 50th Anniversary Print was created in 1995 to commemorate our 50th Annual Howard County Fair. Four local artists donated their time and talents to design the four fair themed scenes. From top left (clockwise), the scenes were beautifully rendered by Frankie Pardoe, Pauline Hood, Mary Morse Jacobs, and Mary F. Streaker. To “draw” the four scenes into one piece of art, the services of Brenda Kidera, another local artist, were secured. She designed a window adorned with a banner featuring our newly debuted logo to “frame” our four fair themed scenes. At a live auction held during our 50th Fair, Print #1 was sold with the proceeds going to the Howard County Fair’s Scholarship Fund. Additional prints were available for sale. In 2013, this beautiful work of art representing our Howard County Fair logo was designed by Kara Ford in honor of the 90th birthday of Elmira Seibert, her beloved grandmother. Each piece of ribbon in this collage is from those ribbons awarded to Elmira for her award winning entries at our fair throughout a multitude of years including the very first one in 1946. Elmira’s talents were rewarded for her excellence in quilting, crocheting, knitting, sewing, canning, and many other areas. 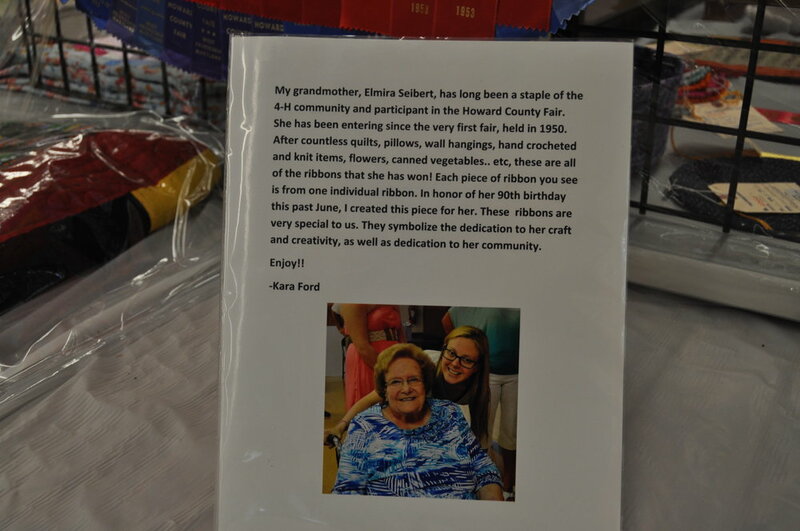 As Kara wrote, “these ribbons symbolize the dedication to her craft and creativity, as well as dedication to her community.” In 2014, the cover of our 69th Annual Fair Book featured a photo of this unique and fitting tribute. 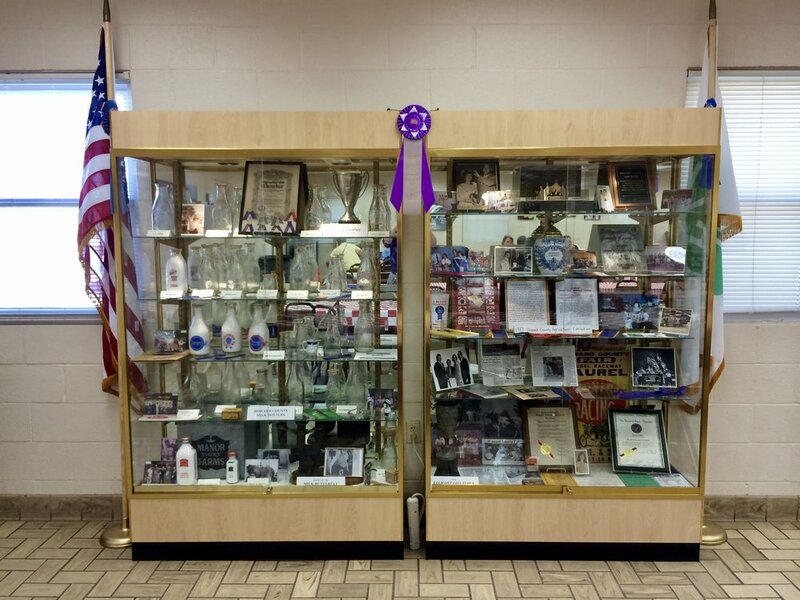 Our display of memorabilia made its debut at our 70th Annual Howard County Fair in 2015. This display serves as a “museum” of treasures with ties to agriculture and/or the fair. The left showcase holds items collected over the years by Charles and Judy Iager. Among those items are a collection of milk bottles from Howard County dairy farms of the past, as well as mementoes representing agriculture, 4-H, and the University of MD. The showcase at the right is filed with Howard County Fair memorabilia from our 1st Annual Fair in 1946 though the present. Have any fair photos or memorabilia from the past? Please send them to Martin Hamilton (Fair Secretary) - secretary@howardcountyfairmd.com. * 73rd Annual Howard County Fair's Schedule is available as an example. The schedule for the 74th Annual Howard County Fair coming Spring 2019!